Suramadu National Bridge is a bridge that crosses the Madura Strait, connecting the island of Java (in Surabaya) and Madura Island (in Bangkalan, exactly east Kamal), Indonesia. With a length of 5438 m, this bridge is the longest bridge in Indonesia today. Southeast Asia's longest bridge is the Bang Na Expressway in Thailand (54 km). 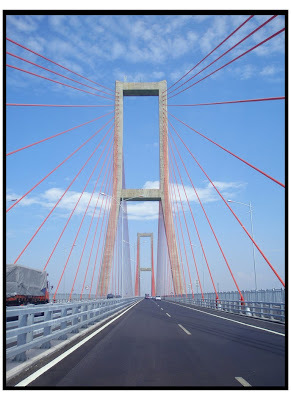 Suramadu bridge consists of three parts, namely the overpass (causeway), bridges (bridge approach), and the main bridge (main bridge). This bridge was inaugurated by the President of the beginning of construction Megawati Sukarnoputri on August 20, 2003 and inaugurated the opening by President Susilo Bambang Yudhoyono on June 10, 2009 Bridge construction is intended to accelerate development on the island of Madura, including infrastructure and economic field in Madura, which is relatively backward compared to other areas in East Java. 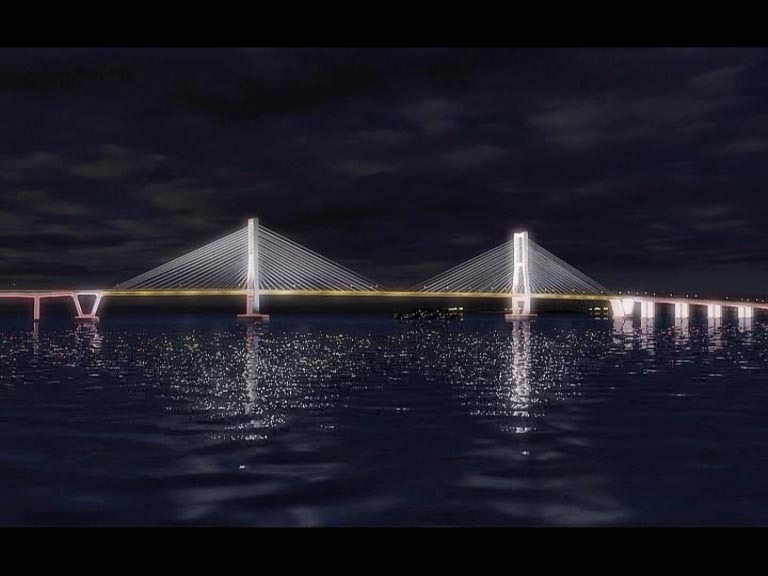 Estimated cost of construction of this bridge is a 4.5 trillion rupiah. 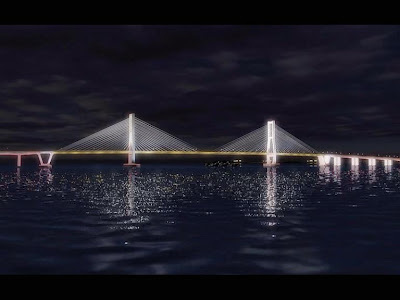 Making the bridge is made from three sides, both sides Bangkalan both sides of Surabaya.Meanwhile, at the same time span was also carried out development which consists of playing bridge and approach bridge. Suramadu bridge is basically a combination of three types of bridges with overall length of 5438 meters long with a width of approximately 30 meters. This bridge provides four lanes in both directions as wide as 3.5 meters with two 2.75-meter-wide emergency lane. This bridge also provides a special lane for motorists outside the bridge on each side Flyover Causeway Road overpass or a bridge built to connect with the road construction through shallow waters on both sides. This flyover consists of 36 spans over 1458 meters on the side of Surabaya and 45 spans over 1818 meters on the side of Madura. 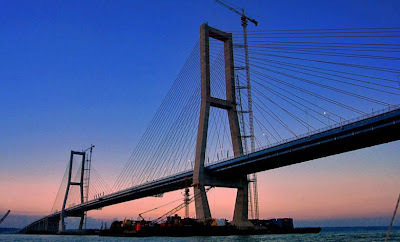 Construction of this flyover using PCI buffer length of each span 40 meters foundation supported 60 cm diameter steel pipe Mediator The connecting bridge or bridge approach, the main bridge linking the elevated road. 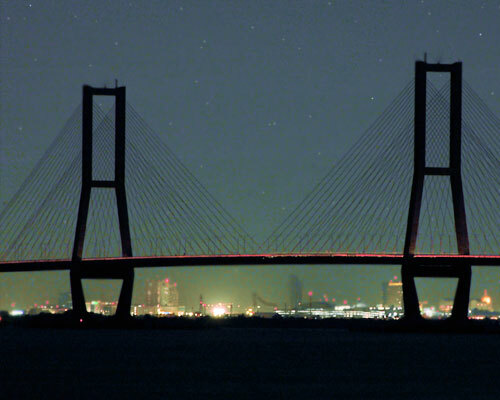 The bridge consists of two parts with a length of 672 meters each. Construction of this bridge using a buffer along the 80-meter concrete box each span with seven spans supported on each side of foundation support 180 cm in diameter The main flyoverThe main bridge or bridge consists of three parts, namely two side spans 192 meters long and one along the 434-meter main span. The main bridge using a cable stayed construction supported by the 140-meter-high twin towers. The bridge deck using 2.4-meter-thick composite construction. To accommodate cruise ships crossing the Strait of Madura, the bridge is providing free space as high as 35 meters from the sea surface. In part this is what causes become difficult and hampered its development, and also cause construction costs to swell.